The state regulates alcohol traffic in Michigan through a 74,000-word law, the Michigan Liquor Control Code of 1998,[*] and through another 37,000 words of rules promulgated by the Michigan Liquor Control Commission. [†] The MLCC was created in 1933. This Prohibition-era bureaucracy is responsible for overseeing and enforcing the control code and related rules system. As part of this alcohol control system, the LCC acts as Michigan’s official wholesaler for spirituous (“hard”) liquor products and issues licenses to alcohol retailers and to beer and wine suppliers and wholesalers. This supplier-wholesaler-retailer troika represents Michigan’s “three-tier” system of alcohol control: No one tier may have an ownership interest in another. This extensive regulation has direct consequences for consumers. Artificially reducing marketplace competition and the availability of alcohol products increases prices and other consumer costs. This year, the state Legislature is expected to remake the legal regulations governing the purchase, sale and distribution of alcohol in the state. 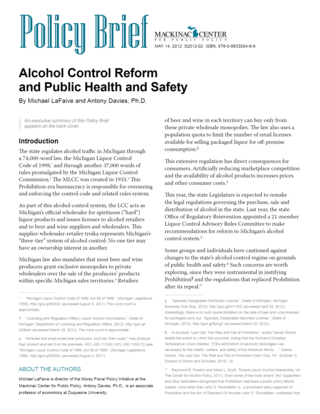 Last year, the state Office of Regulatory Reinvention appointed a 21-member Liquor Control Advisory Rules Committee to make recommendations for reform to Michigan’s alcohol control system. [*] “Michigan Liquor Control Code of 1998: Act 58 of 1998,” (Michigan Legislature, 1998), http://goo.gl/8DtOc (accessed August 3, 2011). The word count is approximate. [†] “Licensing and Regulatory Affairs: Liquor Control Commission,” (State of Michigan: Department of Licensing and Regulatory Affairs, 2012), http://goo.gl/zDBaW (accessed March 29, 2012). The word count is approximate. [‡] Wineries and small-scale beer producers, such as “brew pubs,” may produce their product and sell it on the premises. MCL 436.1113(9); MCL 436.1105(12) (see “Michigan Liquor Control Code of 1998: Act 58 of 1998,” (Michigan Legislature, 1998), http://goo.gl/8DtOc (accessed August 3, 2011). [§] “Specially Designated Distributor License,” (State of Michigan: Michigan Business One Stop, 2010), http://goo.gl/mY1EQ (accessed April 25, 2012). Interestingly, there is no such quota limitation on the sale of beer and wine licenses for packaged carry out. “Specially Designated Merchant License,” (State of Michigan, 2010), http://goo.gl/Ejmg7 (accessed March 29, 2012). [¶] In his book “Last Call: The Rise and Fall of Prohibition,” author Daniel Okrent details the extent to which this occurred, noting that the Woman’s Christian Temperance Union insisted, “[T]he elimination of alcoholic beverages was necessary for the health, welfare, and safety of the American family. …” Daniel Okrent, The Last Call: The Rise and Fall of Prohibition (New York, NY: Scribner: A Division of Simon and Schuster, 2010), 18. But with repeal the problem is far from solved. As Senator Capper has aptly said, “We may repeal Prohibition, but we cannot repeal the Liquor Problem.” If carefully laid plans of control are not made, the old evils against which [P]rohibition was invoked can easily return.